RDs share their favorite recipes everyone can enjoy this holiday season and beyond. The holiday season is upon us, and the party parade has begun. But while many people are accustomed to attending family gatherings and potluck office soirees with nary a thought of choosing between the pumpkin pie or the chocolate cake, clients with celiac disease or nonceliac gluten sensitivity don't have that luxury. "Many of the holidays this time of year revolve wonderfully around food. And not only food, but also eating those holiday foods with others," says Gretchen F. Brown, RD, author of Fast and Simple Gluten-Free: 30 Minutes or Less to Fresh and Classic Favorites, and a blogger at kumquatblog.com. "While those experiences involve traditions and create memories, they also can be challenging when everything from the preparation of the food to the food choices are out of the gluten-free eaters' hands." And no matter how hard a host tries to please every guest who walks through their door, unfortunately not everyone is adept at what it means to eat gluten-free. "As a hostess, the biggest problem is understanding where a given allergen lurks," says Carol Fenster, author of two new books in 2014: Gluten-Free 101: The Essential Beginner's Guide to Easy Gluten-Free Cooking and 100 Best Quick Gluten-Free Recipes, and a blogger at www.CarolFensterCooks.com. "With gluten, it seems pretty clear that wheat flour would be in any baked goods, but not everyone understands this, and gluten can be an ingredient in so many foods. Fortunately, we have better labels today but not everyone is practiced in label-reading." Even if a host or hostess knows to keep gluten out of some of their party offerings, cross-contamination can occur. "Cross-contamination issues are a big problem," says Marlisa Brown, MS, RD, CDE, CDN, author of Gluten-Free, Hassle-Free, president of Total Wellness, and blogger for glutenfreeez.com. "Many times even with a safe food, there are cross-contamination problems, which can occur by using the same utensils, double dipping, and buffets." Cross-contamination and label-less dishes prove especially challenging at buffet-style and potluck events, Brown says, as gluten-free eaters are unaware of what will be served or what kind of cross-contamination may have occurred on the serving table. Many people without gluten intolerance don't know that introducing even the slightest bit of gluten to their guests can trigger symptoms, but it's something gluten-free eaters know full well. "It's terribly important that celiacs adhere to a strict gluten-free diet," Fenster says. 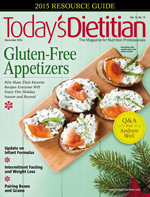 "The long-term consequences of ingesting gluten are becoming increasingly apparent. The damage doesn't just occur in the intestines, but we're learning that gluten (for those sensitive to it) can affect our brains, nervous systems, etc. The consequences of malabsorption such as osteoporosis and anemia may take awhile to develop, but eventually become apparent. Even those with nonceliac gluten sensitivity (like me) can suffer long-term damage that might not be apparent for years, but culminates in more serious issues." Beyond the potential physical effects of ingesting gluten, people's emotions can run high at such holiday parties if a host seemingly puts no thought into preparing food they can eat. "Imagine watching everyone enjoying family favorites while you can't have anything," Brown says. "The other complication is fear of offending someone who bakes a special dish and doesn't understand why you can't just take a little bite," says Fenster, noting that party hosts experience their own set of emotions as they try to keep everyone happy (and healthy). It can be downright nerve-wracking to know that the food people serve at a party has the potential to make some of their guests sick, and Fenster says she's seen this often. "So many hostesses are fearful of inviting people [with gluten intolerance] to a party for fear of making them sick or looking incapable because they can't figure out what to serve," she says. To put hosts' minds at ease, Fenster always explains that she'll eat what she can when she's attending a party, and says humor can help to calm everyone's nerves. "Look at all the calories I've saved by not eating that dish," she'll say to a host with a smile. "But when a hostess does provide something special for me, I take special efforts to thank them profusely because I really do appreciate that they cared." But why not go one step further? To help clients do just that, Today's Dietitian has compiled six recipes for any holiday or New Year's party, and they happen to lack gluten. So whether clients offer them as a gluten-free peace offering to their favorite party host or serve the foods themselves at their own holiday or New Year's bash, with these recipes they're sure to start the party on a supremely delicious foot. 1. In a 12-inch skillet, add 1/4 cup olive oil and heat over medium heat. Brown the eggplant on all sides in olive oil in batches. Add extra oil as needed, reserving 1/4 cup. Drain eggplant on paper towels, set aside. 2. Heat reserved 1/4 cup olive oil on medium-high heat and sauté the onion, garlic, celery, and celery leaves for 5 minutes, stirring often. Stir in the anchovy filets (these will melt). 3. Add remaining ingredients and the drained eggplant. Combine gently but thoroughly and simmer over low heat for 30 minutes, stirring occasionally. Taste for seasonings. 4. Transfer to a large bowl and let cool. Serve at room temperature or cold, with gluten-free crackers and veggie sticks. Tips: I use Red Pack or Tuttorosso tomatoes. You can substitute red wine vinegar for balsamic vinegar. If you're on a low-fat diet, you can substitute low-sodium broth for some of the oil. 1. Heat oven to 425° F. Spray baking sheet with cooking spray. Mix tapioca flour, salt, and pepper in a Ziploc bag. Beat egg and egg white with fork in a shallow dish. 2. Mix cornflake crumbs, onion powder, garlic powder, Parmesan, and parsley in another shallow dish. 3. Place zucchini in bag with flour a few pieces at a time. Shake to coat. Remove from flour and place in egg mixture, then roll in crumbs. Place on prepared baking sheet. Repeat with remaining zucchini. 4. Bake in oven for 20 minutes until browned and crispy. Serve with marinara sauce, if desired. Tip: Reheat leftovers in 400° F oven for 5 to 10 minutes. This will make them crispy again. Crostini are thinly sliced pieces of toasted bread (called toasts). You can top them with chopped tomatoes, puréed beans, diced vegetables, cream cheese, smoked salmon with dill, liver pâté, or other foods. You also can use Parmesan cheese. If you don't have French baguettes, use halved slices of store-bought, gluten-free sandwich bread. 1. Place a rack in the middle of the oven. Preheat the oven to 350° F. Line a 9- X 13-inch baking sheet with parchment paper or aluminum foil. 2. With a serrated knife or electric knife, cut the baguette on the diagonal into thin slices, about 1/3-inch thick (you can use the discarded loaf ends to make bread crumbs in a food processor). With a pastry brush, brush both sides of the bread slices lightly with the oil and rub with the cut garlic to impart garlic flavor. Arrange the bread slices on the baking sheet. 3. Bake until lightly crisped around the edges, about 5 to 6 minutes. Depending on the bread's ingredients and moisture content, it may lightly brown as well. Flip the slices and bake for another 2 minutes. Cool the toasts on the pan on a wire rack until they're cool enough to handle. 4. Spread each toast with 11/2 tsp of cream cheese, a few chopped diced tomatoes, and a sprinkle of basil. Season with salt and pepper, to taste, and serve immediately. Creative Crostini: Crostini (sometimes called bruschetta) are the perfect solution for leftover gluten-free bread, and they're delicious whether lightly toasted or deeply browned. Ingredients in the bread (such as cow's milk) can increase browning. Use any topping you like, but for best results use a cream or paste as the first layer (such as cream cheese, hummus, or pâté) to prevent the toppings from falling off when you take a bite. Try to blend complementary flavors, such as the basil with tomato in this recipe, or smoked salmon with dill. Or try sweet ingredients, such as chutney or hot pepper jelly on cream cheese, or a sprinkle of raisins, currants, or dried cranberries for a pleasing counterbalance to savory toppings. — EXCERPTED FROM GLUTEN-FREE 101: THE ESSENTIAL BEGINNER'S GUIDE TO EASY GLUTEN-FREE COOKING © 2014 BY CAROL FENSTER. REPRODUCED BY PERMISSION OF HOUGHTON MIFFLIN HARCOURT. ALL RIGHTS RESERVED. You can make the following crispy appetizers quickly if you start with a tube of store-bought polenta. But you also can make your own polenta using another simple recipe from Gluten-Free 101. This recipe starts with a simple topping of Parmesan cheese and fresh herbs, but you can use sliced olives, diced fresh tomatoes or sun-dried tomatoes, chopped fresh herbs, pâté, hummus, or tiny bits of prosciutto. 1. Place a rack in the middle of the oven. Preheat oven to 300° F. Line a 9- X 13-inch baking sheet with aluminum foil or parchment paper. 2. Place the polenta on a large cutting board. With a sharp knife, cut the polenta into 12 1/4-inch-thick rounds, and lay the rounds flat on the cutting board. 3. Lightly dust both sides of the rounds with cornstarch. In a heavy, nonstick (gray, not black) skillet, heat the oil over medium heat. Fry a few polenta rounds at a time, turning occasionally, until browned and crispy, about 2 to 3 minutes per side. Transfer the rounds to the baking sheet. Repeat with the remaining polenta, adding more oil to the skillet as needed. Sprinkle each round with salt, pepper, and a tablespoon of Parmesan. 4. Bake in the oven until the Parmesan begins to melt, about 7 to 10 minutes. Remove from the oven and immediately add any additional toppings, if desired (see headnote). Serve hot, garnished with parsley. 1. Preheat oven to 350° F. Slice beets carefully with a mandoline to 1/16-inch thickness. Toss slices in 1 T oil. Arrange in a single layer on two large sheet pans. Stack one pan on top of the other and bake for 20 minutes. Rotate pans and bake an additional 20 minutes or until chips are dried, being careful not to overcook slices. Remove from pans to cool. 2. Repeat with sweet potato and 1 T olive oil. 3. Combine pink salt, thyme leaves, and 1/4 tsp olive oil. Grind mixture together with mortar and pestle or the handle of a wooden spoon. Toss chips with salt when still slightly warm. 1. Combine water and brown sugar in a medium saucepan. Heat over medium heat, stirring frequently, just until sugar melts. 2. Transfer sugar-water mixture to a blender; add wild blueberries and lemon juice. Blend until smooth. Pour in champagne. Chill if warm. 3. Transfer mixture to an ice cream maker; freeze according to manufacturer's instructions until frozen. Keep in freezer.